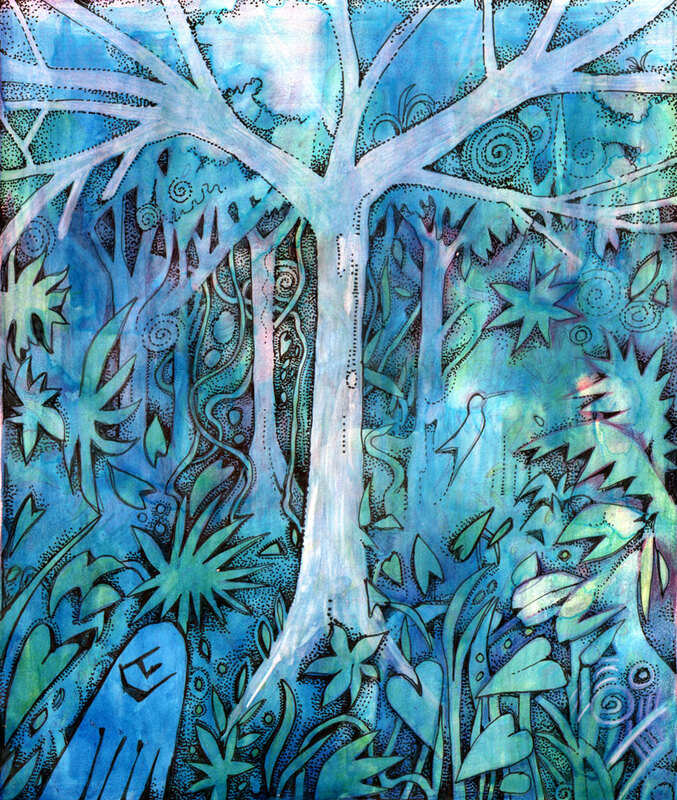 This piece, A Fragment of Forest, first appeared in Earthlines magazine in July 2014. The ceiba tree, tall and straight. Its steel-grey trunk towers high above the fringes and humid darkness of the forest and fingers spidery branches, furred with epiphytes, into the sky. This sacred tree, the Central World Tree or Yaaxchl of the Maya, links the many planes of heaven and earth. 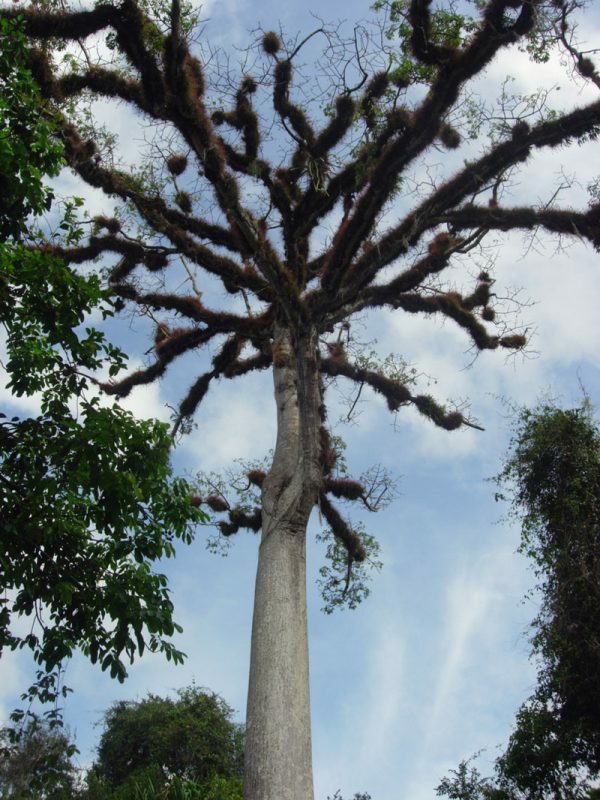 Souls of the dead ascend the mythical ceiba to dwell in heaven in its branches. Some believe the tree harbours deities. Bats hideout in the roots and feed on the ceiba’s aromatic flowers at night; a living link to the underworld. Eagles roost in the branches, wedded to the celestial realm. The ceiba stands majestic and alone like a guard. We pass by and enter the forest on a path towards its heart. Late afternoon and the rainforest orchestra is resonant, a million jaws and claws at work in wood, cellulose, leaf and bark. Monkey, toucan, nut, seed. Drip tip, toxin, thorn, sap. Something tips the ambience to its edge as sharp as saw, as fragile as uncertainty. I gaze at the intricate ganglia of roots to shoots tangled overhead in a cross-hatch of angles and tensions, the ribcage of entwined lianas, the silhouetted canopy etched into a be-slumbering sky. Greens of every shade pervade, emerald, olive, lime, jade with purples and reds, the stained tips of bromeliads, the brilliance of a heliconia flower. Sounds cascade, the many voices of the forest suffuse this “place of voices” so named by the Itza Maya. Rustlings, buzzings, whirrings, sawings – a dense metabolism at work, the workings of a forest alchemy. We pass through seams of sound, wander beneath the leafy garments of trees hung out, wrung out, leant over and swaying with the buoyant bodies of epiphyte, fern and palm. The dark smells of earth hang in the early evening air. Background murmurings are punctuated by the bubbling calls of birds returning unseen to roost and then by the brash rustle and thrash of spider monkeys brachiating along their highways in the tree tops. I am entranced. We are at large in the world of Tikal in El Peten, Guatemala. It is a place of expectation and hesitation, a place of layers, mystery, but also danger. Some tourists were mugged here last month and one is warned to be wary when walking alone. I carry with me an unease that began when I first arrived in the country. Beneath the veneer of tourism babble, weeds of corruption and violence grow rank. But the ruins of Tikal echo with a deeper voice. This evening, I am very slightly on edge, hesitant, but relieved to be away from the tourist throng of crowds and buses, and excited to be once again close to nature. It is the intricate nature of rainforests that appeals to me, the vibrancy, the puzzle and the living, breathing life. To glimpse the unexpected, a lizard darting here, a squabble of birds flecking their colours in the branches there; surprising a boa constrictor in a contortion of roots and having to inch ones way past. Even the discomfort has its place, the sweat bees and mosquitoes, the humidity and heat are all part of the experience. Tikal is a deserted Mayan city state which fell into decline over a thousand years ago. At the peak of its prominence, grand temples, palaces, causeways and stelae were built and the land was deforested and used intensively for agriculture. 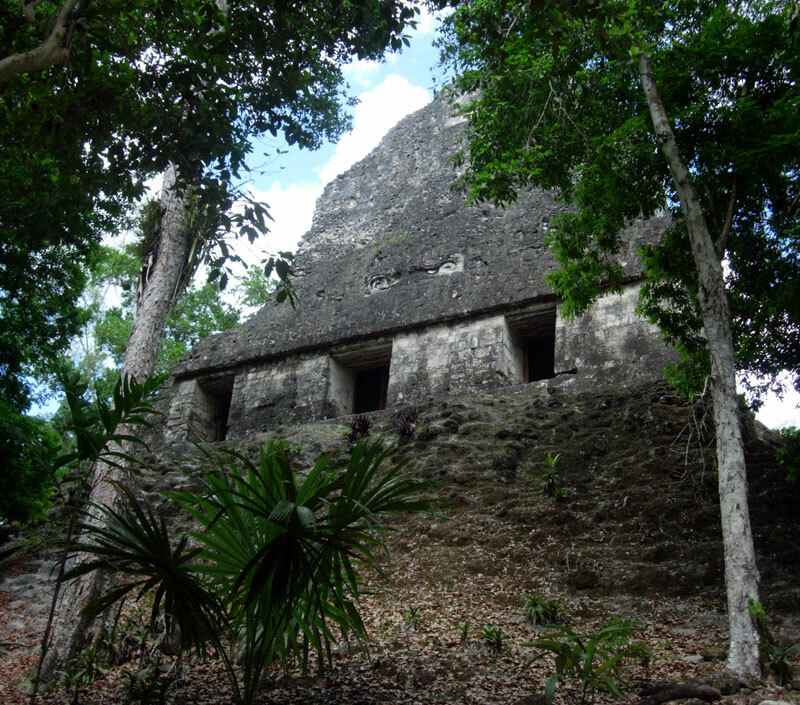 The Maya created pyramids and carved stelae to represent sacred mountains and trees. Around 950AD, after the civilization collapsed quite suddenly, probably due to drought, the city fell into ruin and was eventually reclaimed by rainforest. It was never forgotten though, and by the 1850s was rediscovered and documented by archaeologists. Now it is a destination for thousands of visitors each year from all over the world. However there are some Mayan descendants who will not visit at all, believing that the spirits of their ancestors roam the ruins. An agouti pricks its way across the path, hesitates beside a puddle then disappears into a tangle of darkness. Walking along a causeway we come upon leaf cutter ants carrying their clipped green cargo along miniature highways. Lines of bobbing ants ascend and descend trees on cleanly swept trails, trails that radiate from the underground cities where they compost and tend their gardens. The causeway becomes filled with pink light, the evening pregnant now with the potential of night. After a few minutes I hear a noise, more like a vibration than something audible, coming from my left. It is like feline purring, a soft tinnitus, another sound in this place of voices. A fragment of the forest’s heart splinters off and a tiny hummingbird comes into view unlocked from its own chasm of sound, beating within its own silent bubble. I feel privileged to be caught in a moment with this bird. When the Sun seeks the Moon, says Mayan legend, it becomes a hummingbird. I feel like the moon, feel as though the bird has a message from another world just for me. The moment passes and the White Bellied Emerald is gone, disappeared into the gloom. The trees thin and I glimpse ruins between their trunks, temples of stone lifted up, clothed in pelts of damp moss, sung with the lament of age, each a hunched beast, shoulders above the heads of forest trees. The Great Plaza opens out, grand in its grey garb and flanked by undergrowth and a mottling of trees; figs, cercropias and milk trees festooned with orchids and bromeliads. I feel reverent and circle each temple, clambering steps to sit and watch the scene as evening hangs expectantly. The stones, pock-marked and patterned with grey lichen, are losing the warmth of the day. In the trees, pendulous basket-like nests sway at the ends of branches that rustle with the comings and goings of Montezuma’s Oropendula birds, all liquid melodic calls and flashes of brilliant yellow tail feathers as the colony tries to settle for the night. As the light dims we leave the Plaza and wander away from the path towards a temple glade, following sounds deep as thunder, the plaintive, rasping bellow from the male of a troupe of howler monkeys traversing the canopy. They are loud lords of the forest, calling at dawn and dusk with voices that can be heard for miles around. Soon I see seven black howlers looping limb by limb through the branches overhead, their long prehensile tails wrapped snake-like around branches as they pause to feed on leaves or fruit. We listen and watch quietly from a distance. They feed noisily, food debris raining down to the forest floor, in a typical domestic scene. Howler monkeys are vegetarian, active by day and at home in the treetops beneath the roof of the sky. Come nightfall, when they have finished feeding and the males have quietened their twilight howls, they will sleep on a bed of leafy branches, males, females and babies all in a peaceful group together. Monkeys live above humans, close to the “heavens” in the trees and for this reason they are seen as a kind of sacred people by the Maya. There are monkey deities associated with dance, music, writing and sculpture. According to the sixteenth century Popol Vuh creation myth, there were once two brothers, Hunbatz and Hunchouen, who were talented dancers and artists. But they were envious of their younger brothers, the Hero Twins, who defeated the gods of darkness and death. One day, Hunbatz and Hunchouen took the twins into the forest to hunt birds, with the intention of harming them. They climbed a tree, but the tree sensed their evil intentions and began to grow. It grew up so tall that Hunbatz and Hunchouen could not get down. As they struggled in the branches their loin cloths came loose and turned into tails; they both became monkeys, one a spider monkey, the other a howler monkey. The Hero Twins watched from below as the monkeys shook the tree raining debris down. They were so alarmed that they ran to fetch their grandmother and returned with a flute and drum to calm the agitated monkeys. Hunbatz and Hunchouen became entranced by the music, descended from the trees and began to dance. The Hero Twins and their grandmother laughed in amusement at their dancing antics. This made the monkeys feel humiliated so they climbed back up to the treetops to escape the laughter, and live there to this day. The Maya act out this myth at festivals during which men dress, dance and make mischief. It reminds them not to act immorally or harbour malice. The deep bellow of the male howler monkey sounds like a call of grief. Their voice, melancholic eyes and languid gait have led to them to be associated with the underworld, the realm of the dead. We are intrigued by their similarity to us, we see something of ourselves in them with their range of emotions, their intelligence, compassion and bonding. Many people are grief-stricken to see a monkey killed, it is like a child dying. I remember a few years ago in some other forest place, I would walk out along the dirt road to wait for monkeys at dusk to appear out of the forest. Usually they came, Black Shanked Douc langurs, to rest high up in some tall tree before nightfall, holding dominion over the forest. There was something in the way they boldly looked at me, not staring just looking, with their blue-grey faces and curious knowing eyes, that made me feel a humble sense of kinship. The mood has changed at the temple glade. There is a clamour and black branches are sent into confusion as a dispute breaks out between the dark shapes of the troupe. A monkey chaos unfolds above, surprising us with its violence and aggression. I hold my breath and we step back as the dispute escalates. Suddenly one of the troupe falls and hits the forest floor with a thud just in front of us. The impact breaks the fabric between the wild and human world. We find ourselves involved. A monkey has fallen like a banished god; but there is no music, dancing or laughter. Conflicting emotions arise in me. My instinct is to go to help, but apprehension holds me back. Here is a wild animal and wildness is unpredictable. The monkey lies motionless on the forest floor. Is it badly hurt by the fall? Is it dead? What could have happened up there to cause this? Howler monkeys are naturally peaceful animals and disputes are rare and quickly resolved. I wrestle with the question of whether to intervene or whether to allow nature to take it’s course. Decisions are made and we call a guard, who comes to the glade. As he approaches the monkey it stirs and we see that it is not alone; a black ball of fur, a baby, lies helpless in the leaf litter. The guard takes control. He picks up the baby, which hangs limply in his arms, and carries it away. Clearly shaken, the young female monkey slinks off into the undergrowth to deal with her wounded self and her loss. She disappears before we know what to say. So we say nothing, and our pause hangs open like a wound of silence ringing around the forest walls. I feel uneasy. When is it wrong to intervene with all our human ways of fixing things? We have to leave, so we head away reluctantly with our uncertainties and sadness. We talk a bit as we hurry back, then walk in silence through the forest as the day shift winds down and the night crew tunes up to take over. We tread the limestone causeway, worn to a shine with centuries of use, the forest voices humming with a persistent rhythm from the inky gloom around us; a chorus of frogs, crickets, cicadas and other anonymous singers crackling the darkness. If we could see the sounds, they would glisten like a sky of stars. It is dusk when we pass the old ceiba, reaching its one arm high up into the night, holding it’s place within the many tiers of things. The guards shut the gates, the murmur of sounds like a restless river continues to lap at the forest edge as we are shut out of this other world of the wild, wild garden. In darkness we find our palapa and settle into our hammocks as the night folds over the forest in velvet calm. We never find out what happened to either of the monkeys, the mother who slunk off or the baby taken briskly away by the forest guard. We enquire at the reserve information point the next day and contact a local wildlife rescue organisation by phone and email. There is no information. We wait to hear but no news comes. I feel a sense of belonging, an archaic memory, when visiting places once civilized but now reclaimed by the wild, now held by the forest within its layers of memory. We pass through places and make tenuous relationships with them, experience brief encounters, glimpse fragments of a much bigger picture. There is much, much more. We are guests, it seems, in another world, a natural world, just passing through. 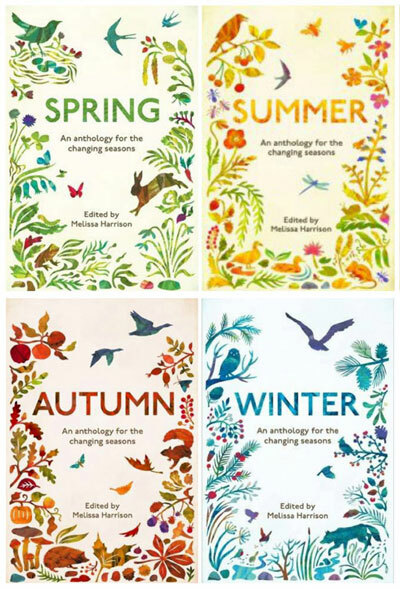 I have contributed nature writing pieces to three of the Seasons anthologies published by Elliott and Thompson in 2016.